Sujoy Ghosh's film 'Revenge' is inspired by the Spanish film 'The Invisible Guest', which has been made in Hindi with a slight variation. It is a thriller movie that revolves around mainly the two characters Naina Sethi (Tapi Pannu) and Badal Gupta (Amitabh Bachchan). Naina Sethi is accused of killing her boyfriend Arjun (Tony Luke) in a hotel room. Naya chooses Badal Gupta as the lawyer who has not lost a single case in the 40-year career. To keep Naina his point, Badal gives three hours so that he can save Nain from the bottom of the truth. Nain starts talking, and many three secrets are revealed in this three-hour conversation. Who is trapping Naina? Who has killed Arjun? Will Nain save the cloud? There are answers to things like this. The original story of the film is written by Oriole Paulo and there is so much speculation in the story that the film keeps you tied for the entire time. As the film progresses, the layer-by-layer talks open. The story starts rolling. As soon as the truth comes out, there seems to be a doubt that it is true? The action in the film is low and the conversation is more. On the basis of this conversation, Badal Gupta reaches the truth. He says that the person who believes proves the law to be true. Both Naina and Badal have been described as cunning. At the beginning of the film, Nain tells the same thing as what is important, but the cloud gradually gains confidence and it sprouts a lot. Through negotiation, it is difficult to guess whether Naina is saving the clouds or is trapped? Who is telling the truth and who lies? The viewers make their assumptions and the movie moves at its own pace. Events from every character's perspective have been shown. The audience has to remain alert all the time. Climax of such films is very important and climax in revenge is not as expected. The manner in which the story is ending seems unbelievable, but by then you have enjoyed the film quite a lot. In the same way, the photograph in the newspaper also seems fake. The name of the movie tells a lot, hence its name and anything could be kept. Most of the shootings have been shot in a room and in spite of this, Sujoy has tied the audience. It is difficult to present such a story on the screen, but Sujoy has done a lot of work. Editing of the film is also fantastic. 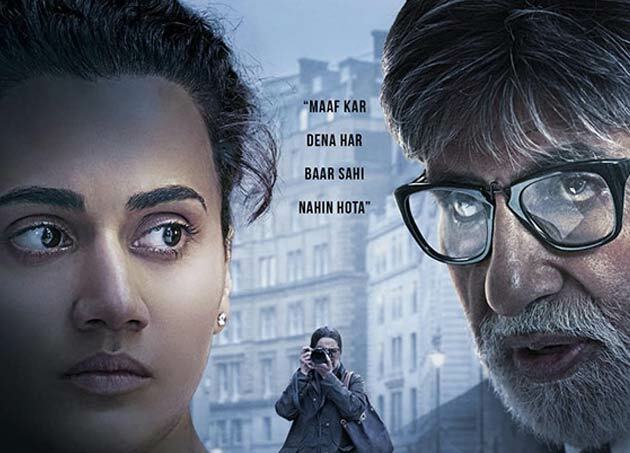 After Pink, Amitabh Bachchan and Tapi Pannu are back together and both have performed amazingly. How Amitabh wins the trust of Tapasi is reflected in his acting. Their dialogue payment is kabil-e-compliments. Through the films like Pink, Manmargiya, Mulk, Tapasi has demonstrated her talent. The name of the change has also been added to this list. Tapasi has presented his character with a lot of strength and has not proved much less than Amitabh Bachchan. Amrita Singh also leaves her influence. The performance of Tony Luke and Human Kaul is also great. Dialogues are good in the film, but their number is low. Songs have not got place in the movie which is the right decision. Cinematography and technical side are strong Sujoy Ghosh's 'story' does not reach 'revenge' till level, but it is definitely worth watching.